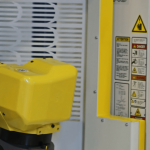 The robot grippers and fingers – together with the robot arm – are used to place the products in the machine. 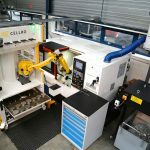 Cellro uses robot grippers from Schunk, the leading brand on the market for robot gripper systems. The fingers are easy to change thanks to the quick-change-system. This allows you to adapt Xcelerate quickly and easily for the next product. Xcelerate X10 is able to stock up to five different robot grippers. With Xcelerate X20, it is possible to have up to six robot grippers. By having the loading robot able to change grippers, it will automatically load products even if the products have different dimensions, whether they are cylinders or square objects or have a unique shape. With the help of the different types of gripper, you can handle a large number of product types. Automatically switching to a second product is therefore possible thanks to the automatic gripper exchange. However, it may also be the case that the machine clamp needs to be changed for a new product. 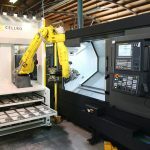 Cellro also provides options here in the form of Fixture Exchange and Collet Exchange. The machine is generally loaded using two-point or three-point grippers. The product is then tightly gripped on two or three sides. It is also possible to have a double-sided or single-sided gripper configuration. By using a dual gripper, the robot can directly exchange the processed product for a new one, thereby keeping machine downtime to a minimum. This feature considerably speeds up the process as compared to working with a single-sided gripper and saves a huge amount of time. An important aspect of the fingers is that they can be adapted to your production process. If you want other fingers made that will suit your product shapes, this can be done. You can have different fingers made providing the movements of the robot (including inside the machine) allow it. If you would like to find out about Xcelerate’s other features, you can, for example, read more about the advantages of drawers and inlays. Alternatively, if you would like to know more about Cellro’s robot grippers and fingers or would like some advice tailored to your situation, contact one of our experts today. 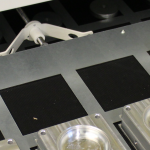 Next post What are the advantages of the drawers and inlays for Xcelerate users?